3Play Media is a company based out of Massachusetts that provides captioning and transcription services to their clients. For a while now they have had an interesting work from home position listed — transcript editor. Note that this company does require that you be a US resident with a college degree before they will consider you as a transcript editor. You will be working as an independent contractor for the company. What does a transcript editor do? 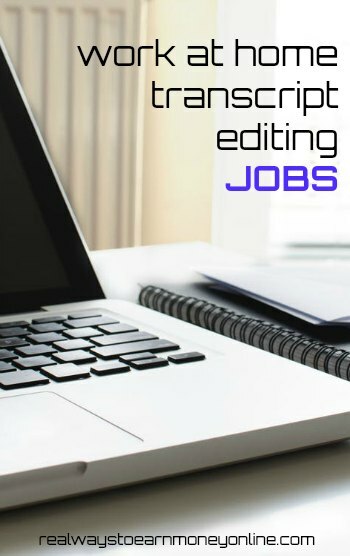 We are looking for flex-time contract transcriptionists/editors to transcribe recorded audio and edit imperfect transcription using a proprietary internet-based software application. Reading this would make me think that the job involves transcribing and also editing imperfect transcription. However, Miranda at WAH Adventures wrote a review of this company earlier in the year and she was able to speak with someone actually working for the company who said the audio you receive has already been transcribed through 3Play Media's voice-recognition software and that the transcript editors just go through and correct the imperfections. How much does a transcript editor get paid? The job listing quotes a rate of $10 to $30 per hour. It's on a sliding scale because more efficient transcript editors can go faster and earn more while slower transcript editors will likely earn less. Payments are made monthly via direct deposit to your bank account or mailed check. Yes, this is very flexible! This is definitely one of those jobs where you can log on and off, accepting work at your leisure — provided there is work available to do. 3Play Media does prefer that you commit to at least 15 hours per week. Note that every job you accept also has a deadline. When you apply, you'll have to take a typing test and do a sample transcript. There is also a little bit of training time involved if you do well on the tests. This company has good feedback overall, but it's definitely important that I mention many of the current workers claim that this is just supplement income and not really more than that. Apparently the work is first come, first serve and it can be difficult to grab jobs from the dashboard before other transcript editors get to them. Several people have also said that they believe it would be nearly impossible to make the quoted $30 per hour listed on the website at the high end of the per hour scale. Most of their workers (experienced ones) say that they do well to earn $10 to $12 hourly. So that is something else to keep in mind. Workers do appreciate management here — apparently they are very helpful and supportive. Pay is always made on time. And of course the fact this is non-phone and flexible work is a huge plus. Bottom line — if you meet the qualifications, it couldn't hurt to apply here, but it sounds like it would not be safe to depend on this as your only job from home. Feel free to read through some of the feedback on 3Play Media yourself here at Glassdoor. You can visit the job listing on 3Play Media's website to get started, but note that even though this job appears to always be posted, the company may or may not be actively hiring for it. Still, it wouldn't be a bad idea to send your application to them for their next hiring spree. If you don't know a lot about transcribing from home, I recommend Transcription Foundations – a free 7-lesson mini-course that teaches you all about general transcription, how much you can earn, where to find work, and more. Post originally published October 3, 2013. Updated and republished on March 18, 2019. As one who is very diligent in research and a stickler for grammar, etc., I found these tests to be insulting and if they are a sample of the work I’d be doing, I’d be bored to death. I did not finish, to say the least. I’d rather do interesting work. I did the math assignment and passed with 87%. But, somehow, they claimed I botched the second assignment even though I listened to the audio more than once. They even sent me an email of all the “words” and grammatical marks I “missed”. However, looking back on the second assignment, I know I didn’t hear these words….and tried to follow everything according to their standards including what I saw on their videos. Oh, and don’t try asking anyone for help when you’re actually doing one of their assignments. Someone may answer your question if you’re doing the sample file of Obama’s speech. But, asking anyone a question for an actual assignment, you will not get an answer. Don’t feel bad if you don’t make the cut. I didn’t, and I have done editing work for newspapers and book publishers. 3PlayMedia leaves their application process running all the time but it’s clear they aren’t always hiring. I got the boot after only the second test, and most of the ‘errors’ I made were not mistakes at all, they were nitpicks about how I used commas. Which is completely subjective when you are transcribing speech. So if they aren’t taking on new staff they will wash you out of the application right quick, and let you think it’s your fault. It’s probably a decent gig if you happen to apply when they need someone, and you have the skills. But if you decide to apply, bear in mind that you will spend a lot of time learning their standards just to pass the tests and it might be wasted effort. Worth a shot if you’re desperate, in my case I wish I hadn’t bothered. Last but not least, the contract you have to sign to do the extended application is predatory in the extreme. It says very clearly that everything you produce, create, or invent belongs to 3PlayMedia. Forever. And there’s no option to amend or negotiate any part of the contract. You got canned too? I’m not surprised when it comes to 3PlayMedia. When I went through their application process back in May 2016, I did okay on the first assignment, but they claimed I botched the second one and sent me an email with a list of “errors”. Some of the corrections were words I didn’t even hear and I played the second audio at least two times. I’m no longer doing transcription and just closed out my Scribie account back in the fall. Needles to say, my contract with 3Play was terminated. At this point, I figured it’s best I do work on my own terms and not bother with working for someone whether it’s a commute job or work at home job. Besides, even if you did get in with 3PlayMedia, make one mistake on an assignment and you’re fired right on the spot. I am currently a transcriptionist for 3Play Media, and I have found success in making it a full-time job, though a lot of it does depend on skill such as familiarity with English grammar and fast typing abilities. I’ve seen a couple comments here about applicants being rejected during the testing phase, so I thought I’d point out that they do have a Standards Guide (which is on a separate page under the Resources tab) that they expect their editors to follow when editing files. It seems that some applicants are unaware that this page exists when they go on to complete the graded tests and are confounded when their account is terminated. The Standards Guide is pretty long, but it’s definitely worth taking the time to read before you do any of the transcription tests, as a good portion of the grades given are based on your understanding of their standards. All I can say is congratulations. I personally found it a bit to be confusing. I just hope you don’t get canned for making a mistake on one of their assignments. Because when I went through the training assessment that’s what they said on one of their videos. After getting my contract terminated for messing up on the second assignment for 3PlayMedia, I think I’m just gonna call it quits on transcription. Obviously, I’m not good enough to be a transcriber or an editor for that matter. The only program that’s worked out for me so far is Scribie. So, I think I’ll stick with them from now on and not apply for anything else at another company. I don’t understand it. I did pretty well on the first assignment, but the second one I completely botched for one reason or another. And I thought I was doing everything so well! I even figured out how to use their special software with my keyboard! I should’ve known it wasn’t a good sign when they took a while to grade my assignment. Last night, when I submitted my first one, it was graded within a matter of minutes. I got a pretty good score too. Now, I wish I would’ve closed my account before they did. The same thing happened to me today. Last night, I got an almost perfect score (4.5/5) on the first test I submitted. But, when I submitted my second test, it took them a while to grade it, which I should’ve known wasn’t a good sign and they terminated my contract like that. I thought I was following directions by inserting speaker titles in caps by using their STOE software and correcting words where the computer messed up. They even emailed me where I made my mistakes. I don’t understand it. I feel better now knowing that I wasn’t the only one that this has happened to. Try Transcript Divas. They’ll accept nearly anyone but it’s tough work. I was very excited about this job and took my time on the application. I received a contractor agreement to sign on the 8th of September, signed it the same day, and saw that I would receive an email with login info “shortly.” A week later, I emailed the listed contact for the training program and let her know I hadn’t received an email with that information, that I had 3Play Media on my whitelist and had checked my junk and spam folders, and received no response. Last Tuesday I received an email that my contract was being terminated. I replied the same day inquiring as to why, as I had followed all the steps I had been given and had received no further promised communication. I have not heard back from anyone at 3Play Media and I’m sorely disappointed since they were so quick to respond and let me know that they liked my application. I was excited to work with a company that I thought shared my values of making things more accessible for everyone, but it didn’t work out that way. I’m so sorry that happeneed. 🙁 Thank you for posting your experience here. I made it through the assessment process (which includes 8 modules of testing, during which you get detailed feedback on your work) and have been currently working for less than a week. I submitted my very first job on 08/18 and now, on 8/23, I have earned just over $230. I currently have a part time job and am doing this on the side. There seems to be plenty of work right now, but of course, as always, that could change. However, as anyone in transcription knows, one of the most important factors is the quality of files they have available. I’ve worked on more than 20 jobs and all of them have been amazingly clear audio or videos. Now, there have been some out there that weren’t as clear, and the pay reflected that, but I wasn’t interested in those, since I’m still becoming familiar with their standards, etc.